This THP is about 14 miles SW of Chester, CA and Lake Almoner, and about 7 miles south of the town of Mineral. Sierra Pacific Industries is planning a clearcut tractor based logging operation in white fir, sugar pine, incense cedar and ponderosa pine forests at an elevation of 4,740 to 5,600 feet. 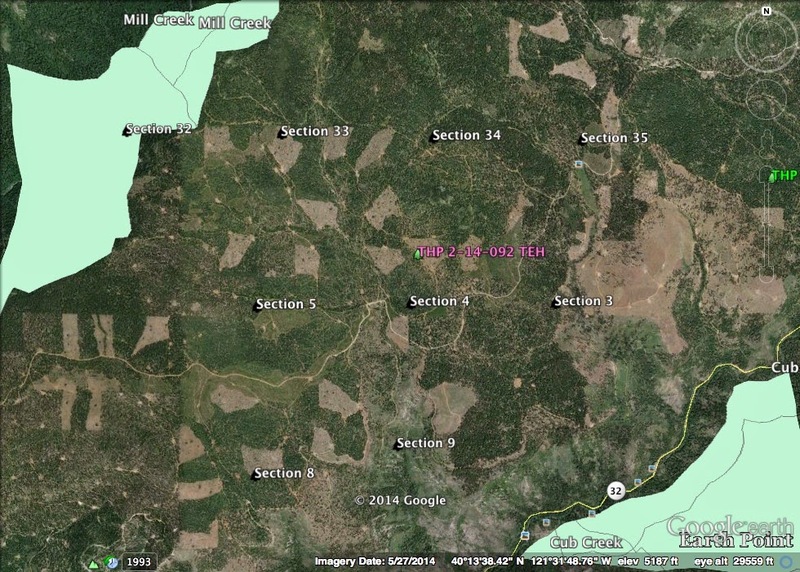 The THP area flows into Deer Creek above Deer Creek Falls, and section 32 is adjacent to the Mill Creek Roadless Area. SPI wants to use temporary roads during the winter period, and multiple landings inside class II watercourses within units 2, 6, 8 and 21. 65 road drainage sites are planned for work including rocking, dip construction, crossing restoration and culvert repair/replacement. Cascade frogs were seen within 200 feet and 1,000 feet of the THP area in sections 3 and 35. More information is available on the THP Tracking Center website.